Unfortunately, the Ford crankshaft pulley problem is an issue quickly on the rise as these aging vehicles pile up the mileage. The main symptoms include an engine vibration and serpentine belt noise that changes with increasing RPMs. In many cases, Ford car and truck owners with the 4.0 L V-6 engines will first notice a belt squeaking type noise. One possible reason for this is the Ford crankshaft pulley has become separated from the hub and the reluctor ring assembly. As you can see in the above picture, the part that looks like a one-piece assembly is actually three separate pieces. The center hub seals the timing cover and carries a ring with metal teeth. The crank sensor uses the high and low spots of the ring to determine crankshaft position. The outer part of the harmonic balancer assembly, called the crankshaft pulley, drives the belt and all of the associated accessories like the power steering pump, alternator and the air conditioning compressor. One of the most critical parts of this harmonic balancer assembly becomes the dense rubber strip pressed between the hub and the pulley. They designed this rubber strip to absorb the naturally occurring vibration found in the Ford 4.0L V-6 engines. Unfortunately, the rubber starts to deteriorate and the outer part of the harmonic balancer assembly, we call the crankshaft pulley, starts to walk up and back as the engine turns. As this assembly continues to loosen up, the serpentine drive belt starts to make noise. The belt shows signs of unusual wear on the edges or shredding as it tries to keep the crankshaft pulley on track at high rpm's. I want to talk about one bolt before we discuss the vehicles affected by this Ford crankshaft pulley problem. There's one important step to this procedure that sets itself apart from the Chrysler 4.0L harmonic balancer problem and other manufacturers with the same issues. The factory installed a torque to yield crankshaft bolt on the assembly line. They designed this specialized hardware to be used only one time. As the crankshaft bolt reaches its factory torque specification, it stretches in a way that holds it in place. This means you don't have to worry about the bolt backing out as the engine spins up to 5,000 RPMs. However, this also means that you can't reuse the bolt when putting things back together. Let me make an important point about this torque to yield crankshaft bolt. In some cases when people try to reuse it the head comes off and now owners must deal with getting the piece of bolt out of the crankshaft without any further damage. This situation leaves the potential for this job to snowball into something really ugly. When you consider that a replacement bolt carries a price tag of less than $10, I personally consider this money well spent. The crankshaft bolt uses an 18 mm head and carries an initial torque specification of 66 foot-pounds. We'll provide some additional technical tips in the next section to help you decide whether this repair falls within your skill set. Another important point to make is the difficulty of this repair really depends on the model of vehicle you attempt it on. As an example, a rear wheel drive Ford Explorer with the 4 L V-6 requires removal of the viscous clutch fan assembly. This task requires some special tools and might not be right for everybody. The problem we’re discussing in this article most frequently occurs in Ford 4.0 L V-6 engine powered vehicles. This includes really popular models like the Ford Mustang and F150 with the SOHC v6. It also includes the Explorer models with the sport trac option and other rear wheel drive V-6 engines. Always confirm you have the right part before you begin. Subtle differences between models and years exist. With that said, the vehicle I first performed this operation on included a 2004 Ford Explorer with the same 4.0 L V-6 engine. When you add the 04 to 08 Mustang or the Ford Explorer, we're talking about a lot of cars and trucks. During these years Ford broke several records for unit sales. This sets the demand for replacement parts at a high level. In turn, as we learned from supply and demand equations the price is coming down on replacement parts. With that said, it doesn't make it any easier to perform the job in your driveway and we'll talk about this more in the next section. A lot of vehicles with a 4.0 L V-6 use a clutch fan assembly. Without diving too deep into what a viscous fan clutch is, let's focus on how to remove it. Because it mounts to the water pump pulley you can't just put a wrench on it and pull. If you do so, you just rotate the water pump pulley. Therefore, you need to use a strategy for removal. I have seen plenty of people get the clutch fan off without using specialized tools. However, doing it that way becomes a struggle. The 36 mm shaft that supports the clutch fan tightens as it spins. This is why it's so hard to break loose and why you'll need some leverage. The specialized fan removal tools hold the water pump pulley on the one side and the 36 mm specialized wrench has a half inch drive insert allowing you to use as much leverage as necessary. Note that when the clutch fan suddenly breaks loose, your hands must be clear of any impact spots. You should also wear protective gloves, because removing the clutch fan is a knuckle busting operation. As mentioned in the opening, the crankshaft pulley is the outer ring of the harmonic balancer assembly. To remove these pieces from the crankshaft, we'll need a universal puller set that grabs and pulls the center hub evenly. Note that in some cases, the cheaper universal puller sets don't come with the right size bolts. No need to panic. Any hardware store can set you up with the correct bolts for the job if they aren't included in your set. Also note that holding the flywheel is necessary during the removal and installation of the center crankshaft bolt. There's a ton of ways to hold the crankshaft. Of course, I prefer to use a flywheel holder, but stopping the crankshaft from rotating is more important than how you do it. 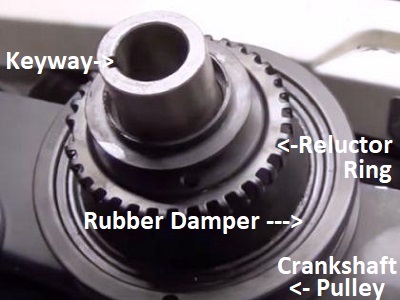 Here is a video of an interesting method of installing the Ford crankshaft pulley. 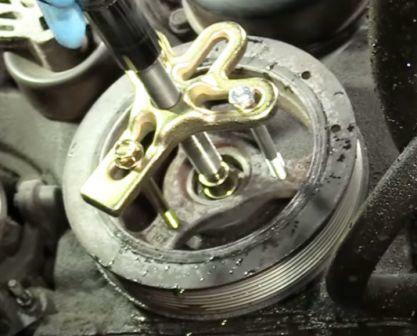 This video includes the preferred method on how to perform the final torque operation on the center crankshaft bolt. This helpful automotive article comes from our miscellaneous auto repair section. There you can find articles about hard to categorize car problems. If you have a Ford F150 pickup truck, take a look at these interesting articles about how to fix the door latch cable instead of replacing it. If you own a Ford Explorer, you might be interested in a ignition switch problem that's also developing on these vehicles.